How to make your own font character in XP. The link gives the basic instructions. I tried it out a couple months ago. 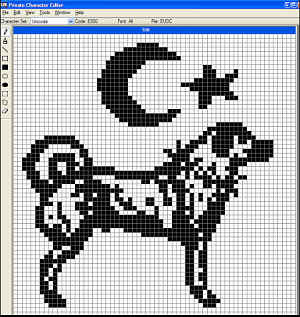 The doggie image is based on an old gif I made when I first created my Semavi dog, Anatolian icon. Actually, it was in PCX format back when and the original didn't have a spike collar -- I just added the collar for this exercise. The dog is not a very good likeness of any of my dogs, but at the time it was all done dot by dot twenty years ago on an old XT computer with an old DOS computer, no Windows! I just hang on to the pic, never sure how I'll torture the thing next time I run into it. The odd thing about it is that over the years with different base image rendering programs, the proportions of the leg and body length changes depending on the program and font that renders it. Sometimes the image is very square and other times it is stretched left to right. I haven't tried to figure that out. You can see it rendered above in Wordpad, along side other decorative fonts for fun. Real useful, ha, I know! Give it a try if you've got a logo or evil little icon you want to mess with. I'd put a sample of what this ɯɐɹƃoɹd can do, it's so ʎןןıs, but you can go ʇno ʇı ʎɹʇ for yourself! I found a wonderful captioned Bill Cosby video. Enjoy! I'd love to be added to your blogroll. Oh, your blog has a really cool header. Sure, will add you to the blog roll. It's still 'broken' as I write but soon as it's fixed, you're on!